The customers can withdraw money from any (i.e. an Axis bank card holder can withdraw from a ICICI bank atm) ATM without paying any charge. 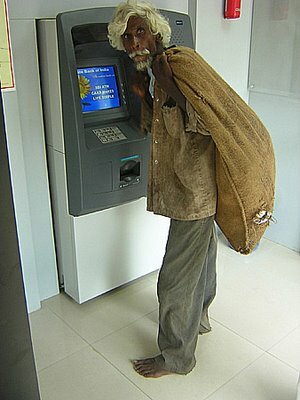 The Reserve Bank of India has directed the commercial banks to let customers’ free use of Automated Teller Machines (ATMs) for all transactions from 1 April 2009. According to an RBI announcement, the customers can also use ATMs of other banks for balance enquiries free of cost. However withdrawal by use of Credit cards and use of international cards will attract a fee. So from now on, all Bank atm’s are my bank’s atm. Donald C Wetzel introduced the concept of ATM (Automated Teller Machine) way back in 1969, but it was introduced in India by HSBC – the Hong Kong and Shanghai Banking Corporation in the year 1987. Since then there has been an explosive growth in non human interaction at banks. ATMs can be termed as “Life savers” in case of emergency, as you would find that ATMs are placed not only near or inside the premises of banks, but also in locations such as shopping centers/malls, airports, national highways, grocery stores, petrol/gas stations, restaurants.